HAG Rocks! 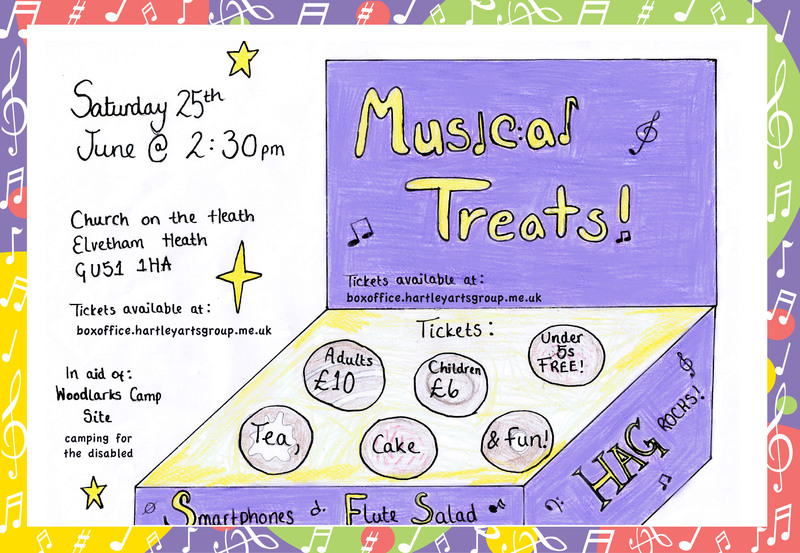 are gearing up for their annual ‘Musical Treats’ event which takes place at The Church on the Heath at Elvetham Heath on Saturday 25th June at 2:30pm. Enjoy the sound of the choir and the musical talent of Smartphones and Flute Salad. It’s all in aid of Woodlarks Camp Site camping for the disabled. Tickets for this excellent event for such a great cause are available at: www.ticketsource.co.uk/hag (Adults: £10, Children: £6 (under 5’s free)). Plus caaaaake! This entry was posted in HAG Rocks!, Uncategorized by Hartley Arts Group. Bookmark the permalink.